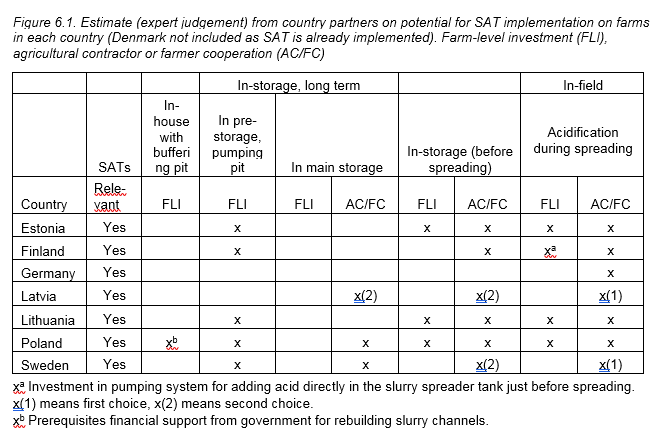 There is good potential to integrate the currently available slurry acidification technologies (SATs) with existing manure management system in the Baltic Sea region countries. This is shown in a newly published report produced by Baltic Slurry Acidification project. The report “Possibilities and bottlenecks for implementing slurry acidification techniques in the Baltic Sea Region” assessed the potential to implement the known SAT techniques on pig and cattle farms in the region. In the report the existing manure handling, storage and spreading types were assessed. The report is based on Eurostat and national data on manure handling. The technical solutions chosen for assessment both for the project and the study are in-field, in-storage and in-house technologies. 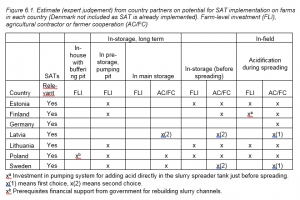 These solutions are currently available on the Danish market, where slurry acidification is already used almost for 20 % of slurry. The experts responsible for the report conclude that in-field acidification has the most potential due to its nature as a mobile, add-on system to existing manure spreading systems, eg. with trailing hoses/band spreading. The in-field system is also the lowest in terms of investment cost, it requires the least amount of acid and is suitable for provision as a contracted service. The report finds in-storage and in-house systems more challenging, mostly because the initial investment costs are higher. Installation of in-storage systems requires renovation of existing animal houses and manure pumping systems. The investment cost of the in-storage system is increased by the demand for extra storage capacity to accommodate foaming of slurry during acidification. However, a variation of the in-storage system, one which acidifies all slurry sent to the storage (referred to as in-storage, long term), can make this problem obsolete and indeed was found to be the second-most potential acidification technology. By country, the most potential is seen to exist in Germany, where about 55% of the agricultural holdings fertilize their fields with liquid manure or liquid digestate. The new regulation adopted earlier this year to prevent broadcast spreading on arable land by 1 February 2020 (and on grasslands by 2025).